At the end of 1945 Bryan Osborne had his first glimpse of India, having been posted there during army national service. In 1968 he returned with other colleagues, representatives from War on Want, an organisation supporting Indian agencies. This was at the beginning of Gandhi Centenary Year October 2. 1968-69. During their visit they were able to see many aspects of Indian life. They were honoured in being granted an interview with the Prime Minister, Indira Gandhi. Work by Indian agencies with the people in the villages was impressive and also was the strong sense of community existing in those villages. We learnt of the work of the Gramdan movement, under the leadership of Vinoba Bhave, India’s “Saint on the March”. Supported by Sarvodaya workers through out rural India seeking to apply in concrete terms the teaching of Mahatma Gandhi. Bryan is an accountant by profession, born in Bristol, England. His small step into Indian literature strengthened the view of India as being the Cradle Land, not just a geographical location but a state of mind. Vinoba Bhave, social reformer and man of God is seen as a unique personality of the Indian sub-continent, and amongst the greatest social revolutionaries of the twentieth century. Vinoba had joined Mahatma Gandhi in 1916 at the Kochrab Ashram, Ahmedabad, and was later selected by Gandhi in 1940 to be the first protester in the campaign against the British authorities. Pandit Nehru, the first Prime Minister of India, was to be the second protester in the freedom struggle. The origins of Vinoba's book 'Talks on the Gita' are based on talks given by him while serving a sentence in Dhulia prison during 1932 for his part in the non-violence struggle against the British Raj. 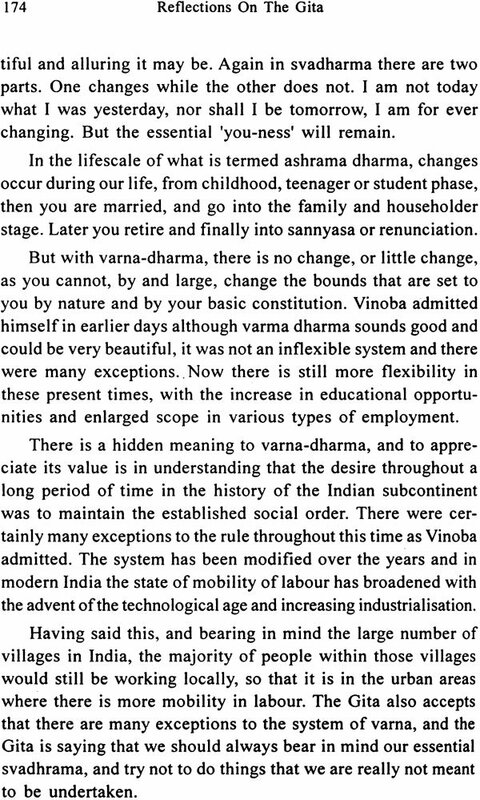 Vinoba was an original thinker who could not be placed into any category. He did not belong to and would not join any group, society, welfare or political organisation, although continually working on socio-economic issues, mainly engaged working in Indian villages with Mahatma Gandhi during the period 1916-1948. After the achievement of Independence for India in 1947 he was regularly advising and having talks with the Prime Minister, Pandit Nehru. 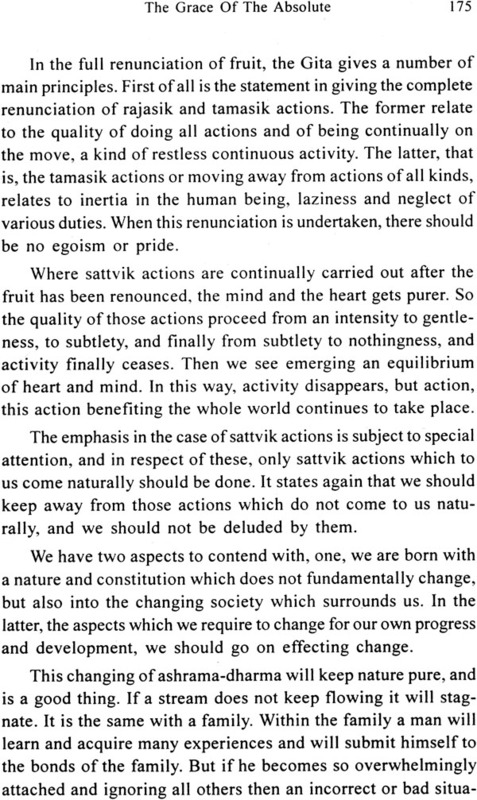 Once Vinoba remarked that he did not deal in opinions, but only in thought where there can be give and take. A Hindu to the very fibre of his being, Vinoba also made repeated studies of the Koran and the Bible. He said that he had no permanently set views and did not hesitate to express one view today, and another tomorrow, maintaining that he was thinking differently every moment and changing all the time. Vinoba came from a high caste Brahmin family, his father Narhari Shambhurao was a textile technologist of strong character and his mother Rukminidevi a very devout lady. From his mother Vinoba had received encouragement to continue religious studies, and what became a life-long search for truth. She encouraged him not to marry and remain celibate for the whole of his life. This Vinoba did. In those early days when working at Gandhi's ashram in the early twenties, Mahadev Desai, Gandhi's private secretary, wrote a special article for the magazine Young India, where he said that a day with Vinoba was a proud one in anyone's life. He remarked that the outstanding characteristic of Vinoba was to resolve decision into action the moment it had been made. The second quality was that of continual growth. 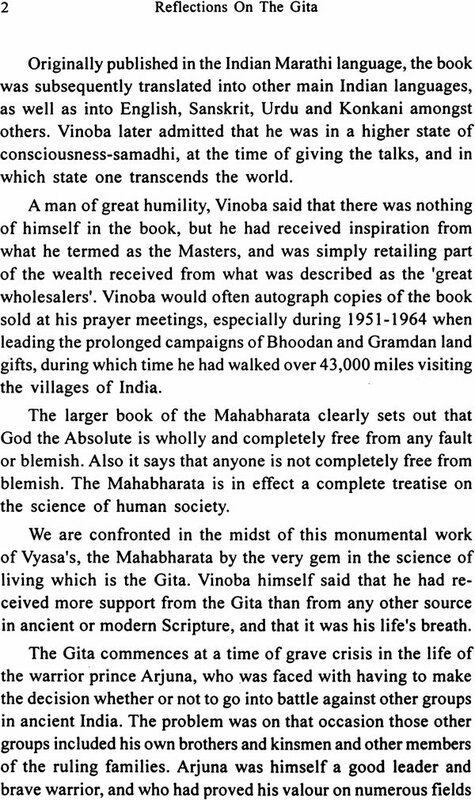 'Besides Gandhi, this quality was found in Vinoba alone'. Vinoba Bhave once said that he had received more nourishment from the Gita than he had from his mother's milk. Where the heart is touched in this way he continued, there is no room for argument. 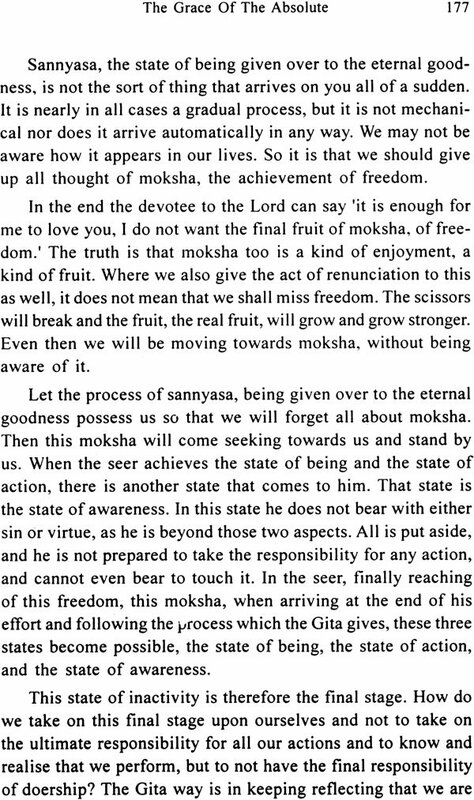 Vinoba describes the feeling of flying into the heavens of the Gita that was his life's breath, and again, diving into the depths of the nectar that is the Gita, and resting there in the warmth of it Gita the Mother. 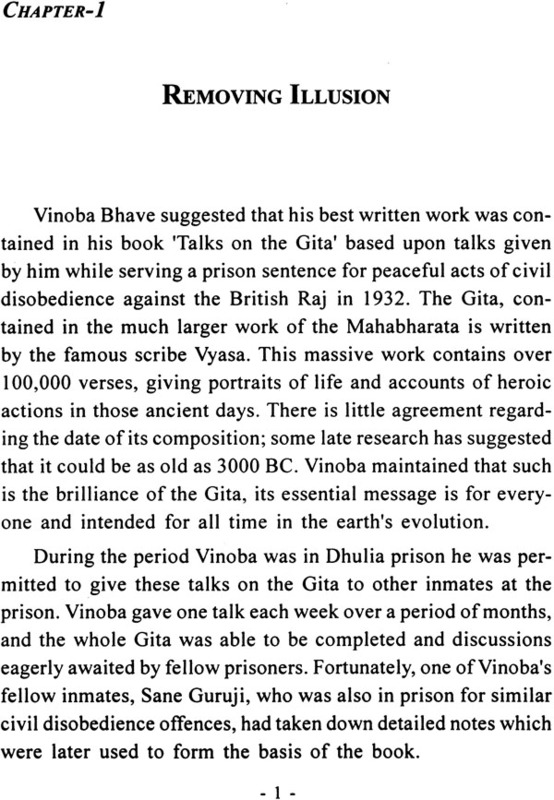 Vinoba had written to Mahatma Gandhi in 1916 and was later invited to join Gandhi's ashram. At that time Gandhi was already directing the non-violent freedom movement against the British Raj.1t was seen by those whom came into personal contact with Vinoba Bhave during those early days that he possessed an originality of mind and character, a spiritual quality placing him in a different category, and from the very beginning it was recognised that here was someone special. Possessing great humility, Vinoba described himself as a mere student throughout life. When records of Vinoba's work and life are traced it is seen that there is a continual series of experiments in living, undertaken by him, including the Bhoodan and Gramdan campaigns, the land gift movements started in 1951, and which continued for seventeen years. During that time he walked the length and breadth of India asking for gifts of land to give to the landless. In those campaigns it was emphasised many times that not only physical gifts of land were needed but a change in the hearts of people leading to a non-violent society. Although Vinoba during this period was regarded as a saint in a land where there have been many saints and seers throughout its long history, he was well aware of the humility portrayed in the Gita which he himself tried to follow. The message of the Gita, he said, would last long after any reports or descriptions of the Bhoodan and Gramdan campaigns may have been uncovered by researchers and others. 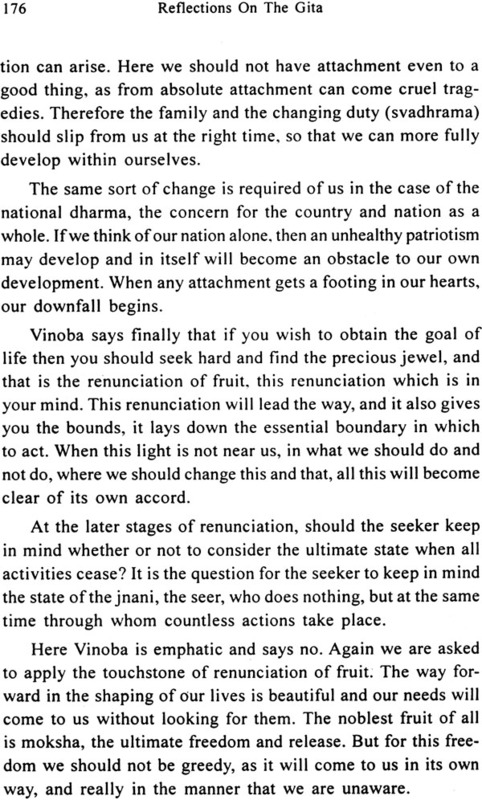 Vinoba liked to remind people that India, the cradle land, was the land where knowledge of the eternal reality, Brahma Vidya, was born. A subject scholars and others have long debated, there appears to be a strong case to believe that the beginnings of civilisation took place in India. Although ecological and geological conditions in the Indian subcontinent were then quite different from what they are today, a strong view can be put forward that India is indeed the cradle land, the first stirrings of civilisation evolving there. The period in question appears to date from about 10,000 years ago when the last Ice Age was petering out, and more favorable climatic conditions gradually emerging. 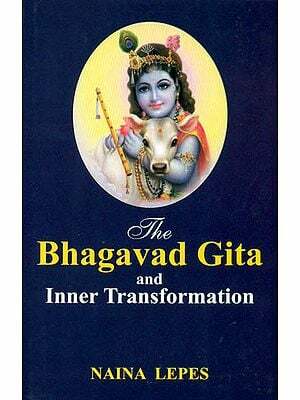 The Bhagavad Gita itself is contained in the greater work of the Mahabharata by Vyasa, regarded as the very essence on how to live. The original Vedas were seen as abodes of knowledge containing a number of sections in that treasure house of learning. The various sections included works on health care, music, political economy, dharma and principles and ethics of individual social conduct. Regarded by Indians as the basis of all Indian philosophy and culture are the ancient texts of the Vedas, the treatises on the science of life. 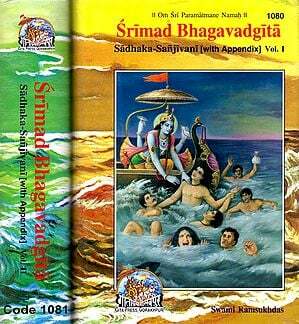 The Vedas had previously been handed down from the seers/scientists to student or disciple by word of mouth. This oral tradition demanded great discipline and training, both in grammar, pronunciation, and recitation of the verses and hymns. Gradually this oral system came under increasing pressure and it was then that the great sage/seer Vyasa, seeing a decline in this remarkable tradition of orally preservation of the truths, rites, rituals, mantras, poetry and sciences, that he, with a band of seers and scholars working under him, recognised the need of recording this ancient philosophy so that the eternal wisdom of the past could be preserved for future generations. The task performed by the seer/scientists of those ancient days was recorded in Sanskrit, the language of the times with its rigours and discipline, and structure of pronunciation and grammar. The urgency for this course of action was recognised by Vyasa, bearing in mind the troubled times the princely states of the Indian subcontinent were passing through in the political, military and social spheres of the time. The subcontinent of India has long possessed numerous faiths and it was realised that the various rites and rituals were acceptable to the followers of those faiths so long as the main principles contained within them could locate their origins in the Vedas. 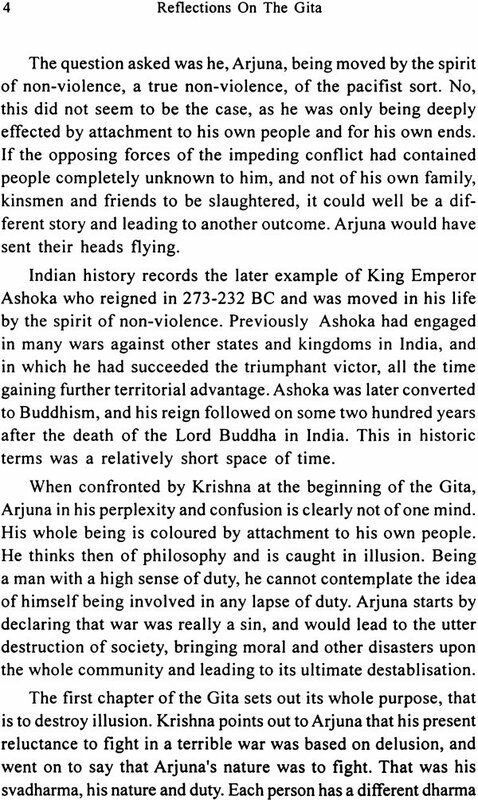 The crisis occasioned by the story of the forces of good and evil, illusion and truth recorded in the portrayal of the Mahabharata war, have ever been present in human society. The date of the war is put as C3100 BC, while some authorities give the later time of C 1300 BC. 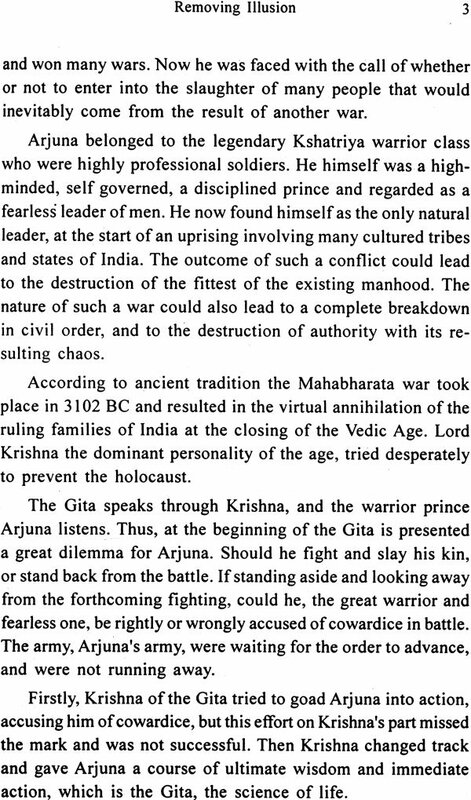 Whether a battle actually occurred between the warring princes as described in the Mahabharata or was just an legend illustrating the forces of good and evil in the world is not completely known, but there is a strong belief that a battle actually took place. The ancient philosophy contained in the Vedas appears to relate to a time when the rivers of northern India had become free from the previous frozen Himalayan reaches at the time of the last ice age. Gradually the great Saraswati river in Northern India was formed, and over many thousands of years, its course is reputed to have changed and around 2000 Be finally dried up. The society living in the Saraswati basin during that period were deemed to have enjoyed a rich culture. Many minds gave themselves to the pursuit of knowledge and especially fundamental questions concerning the origin of the universe and the forces governing it. The seer/scientists of the age were engaged in this quest for truth. Their vision enabled them to see and delve into the reality of the cosmos. They gave to posterity a valuable heritage to those following on. The knowledge and insights were a blend of theory together with what were carefully de vised practices. These ancient texts, writings and compositions containing profound thought and penetrating analysis, have suffered from serious distortions over a long period of time, due to foreign invasions with the subsequent political, social and economic consequences. It was unfortunate that many precious legacies were lost at various times in the past. Only in the last hundred years or so has that invaluable heritage begun to be resurrected.